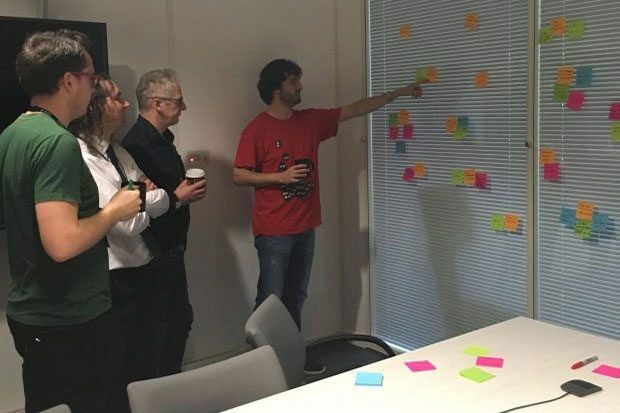 We recently went to the fantastic Agile in the City conference in Bristol, and attended a talk by Olaf Lewitz and Ken Power on facilitation. It included the idea of ‘pair facilitation’. 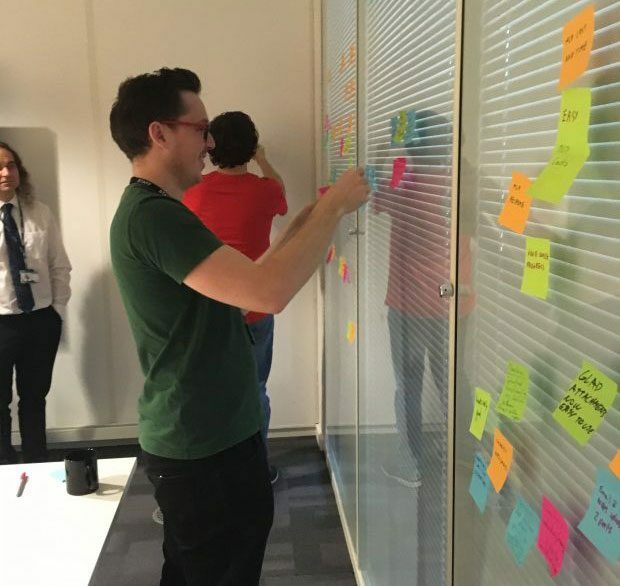 We thought we knew most of the tricks involved when it comes to running retrospectives, but we’d never come across the idea of running a retro alongside one of your team members though. So we set about planning and running a pair retro. Here’s what we learned from the experience. The first step was to plan the retro. Typically we follow the 5 stages of a retrospective. So together we planned out an activity for each stage. For each one we agreed a timebox, and agreed who would lead. As we hadn’t done this before, we thought it important to have someone leading on each activity. This seemed like the best way to avoid confusion and discussion if we had slightly different ideas on how an activity should be run. Importantly we brought a list of the activities we were running, along with the timeboxes and who was leading on each, into the retro. This made sure we both had an agreed idea of what we should be doing at any point. The benefits of having 2 of us running the retro became apparent from the start. We usually have a reasonable amount of setup to do for a retro. And with quite a large team getting everyone there for the start is always a challenge. Splitting this work between 2 of us meant we started on time and didn’t miss out on any of the setup. Once the retro kicked off we managed to stick fairly closely to the plan. Switching back and forth between the leader every few minutes meant that whilst one person was leading, the other could be thinking about and preparing for what was coming next. Sticking to timeboxes in our retrospectives is often a bit of a challenge. Having 2 people really conscious of the timeboxes and the importance of sticking to them meant that we ended up following our retro plan pretty closely. At one point we did run over on a timebox by a few minutes, but the space given by sharing facilitation of the retro meant that one of us could spot this and shorten the next activity. By the end of the retro we’d kept to time and come up with 3 really strong actions to take into our next sprint. We always take feedback at the end of our retros and the whole team were really positive about the experience. Running the retro together worked so well, we agreed to try it again next time. Christina was keen to give it another shot, but we also thought it might be good to rotate it around the team a bit. The only change we would make would be to pick up on a bit advice given by Olaf and Ken in their talk. We tended to stand fairly near each other at the front of the room, which gives the impression of us leading a meeting. By positioning yourselves on opposite sides of the room you can make the meeting feel less like a presentation and more a collaborative effort. Other than that we both agreed that running the retro between 2 of us was an unqualified success. Not bad for our first time out! Running a retro typically ends up being my responsibility in our team. It’s something I love doing, but with a couple of caveats. Firstly: I find it really tiring and more than a little stressful. This is something I don’t see when running retros for other teams, but the combination of running a successful retro and being truly invested in the outcome is a real challenge. Secondly: it’s really important for me to take an active part in our retrospectives. I’m a team member too after all. Balancing this and running the retrospective is really difficult. I often find myself taking a back seat in the discussions as I’m focussing on ensuring everyone else gets their say. Splitting the running of the retro solved both these issues for me. The experience was energising rather than tiring, and pretty much stress-free. I also found myself able to fully engage in the discussions, as I knew if I was talking too much Christina would be able to ensure other people got their say. The most telling point was at the end of the retro when both Christina and I gave feedback along with the group on how the retro was run. This is something I’d never even considered doing when asking for feedback after running a retro on my own. 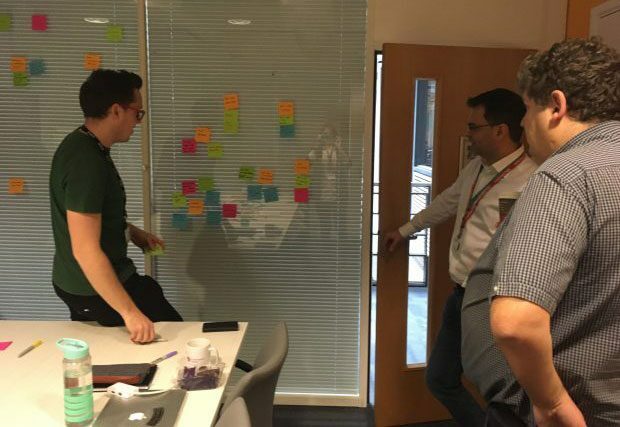 For such a simple idea running a retrospective as a pair had a really big impact. Having done it once I don’t think I’d be keen to go back to running retros alone. I thought pairing on running a retro sounded like a really interesting idea, and was happy to help. I’ve run a couple of retros in the past, and I know from experience that when you’re running a retro on your own, you don’t get to participate in the same way as everyone else in the room. I thought there would be a lot of value in enabling David to participate more within the session, whilst also giving me an opportunity to learn from David sharing his experience in running retros. When we sat down to plan the retro I felt like I was learning already. I knew the 5 stages of a retro in principle, but I felt in our planning we were discussing detail that I wouldn’t have thought of if I was preparing on my own. Breaking up the retro to divide the tasks really encouraged an attention to detail too. The retro itself went really well, and I enjoyed being able to participate as well as lead. Knowing the format of the retro ahead of the session, meant I was able to prepare my thoughts ahead of time, so I wasn’t set back by leading and could still contribute. I would say the pairing exercise was a success; the team gave good feedback on the session, and both David and I thought it worked really well. I’d happily pair on retro running again soon, and am also pleased to see other team members are also keen to give it a go. Follow Defra digital on Twitter and don't forget to sign up to email alerts.